We’ve been collecting data for decades. We keep everything ͚just in case. But a year down the line, we’ve forgotten what each file contains. How do we know what we need? And how do we find the data we’re looking for? Classifying data one piece at a time, as it’s created, is manageable. But what do you do when you are up against a wall of data files; old data, past research projects and important records, each up to ten years old. And how do you find it when you need it? Aside from this, there is an increasing pressure on businesses to be able to put their hands on data when it’s needed, delete it upon request, or handle personally identifiable information (PII) securely. But, if you don’t know what data you’re storing, how can you meet these legal requirements? Data discovery software can help you to understand what data you’ve got, where it͛s hiding and find the data you need to keep. By scanning vast quantities of data at a time, data discovery software can reduce the time it takes you to understand your legacy data from years to days. It doesn’t just help you to understand the data you’ve got. Software will classify it for you too, applying metadata as it goes. So you can see what data you’ve got, and retrieve it when you need it. And once your data has been classified, it too can be protected by your third party downstream technology, as data classification metatags trigger data protection measures in line with your company policy. You can track your classified data, so you know its journey and the threats it’s up against. And you’ll be able to drive down your data storage costs by identifying any redundant, obsolete, or trivial (ROT) data for deletion. Once you’ve identified the data you’ve got, classified it, and applied data protection policies through downstream technologies, you’ll find compliance easier to monitor, and to prove. We secure the entire journey of your data, from consultancy and technical design, right through to installation, training and support. With over 4000 end users, an Insurance industry client came to HANDD for help. They needed to ensure policy details couldn’t be sent to unauthorised external parties by email. Using data classification, we identified and classified new documents containing policy numbers. Then we integrated the classification platform with the client’s Symantec DLP solution, enabling DLP to work more efficiently to ensure sensitive content only travels to cleared recipients. With billions of records to sift through and strict compliance mandates, a global bank needed to get control over their legacy data. First, using a discovery tool HANDD helped them identify their sensitive data and discover where it was stored. Then, we labelled their data using Data Classification. This enabled them to apply protective measures efficiently to their most sensitive files for the first time. Staff typing SECURE into email subject lines to trigger downstream protection of sensitive data left plenty of scope for error. At this leading financial services organisation classification was inconsistent and ad-hoc. Security of delivery was unreliable. They contacted HANDD for help improving their classification processes. We implemented a Data Classification solution that would automatically classify emails. Integrating with a message gateway it prevents data falling into the wrong hands. 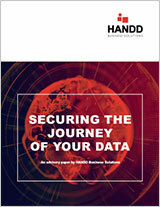 HANDD is an independent specialist in global data security. We are suppliers to 8 of the 10 largest banks in the world, 2 of the world’s top 5 investment organisations, and 45% of the FTSE 100. ©COPYRIGHT © 2018 HANDD BUSINESS SOLUTIONS. ALL RIGHTS RESERVED.